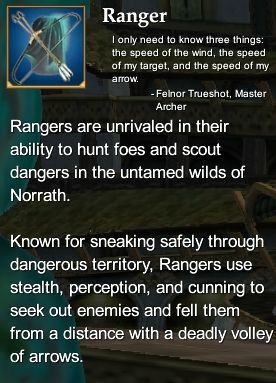 The ranger is a master of stealth combat, utilizing the forces of nature in his attacks, mimicking the movements of animals in his defense, and unleashing a blinding storm of arrow upon arrow on his unsuspecting enemies. His damage from afar is unparalleled. He is slow to grow into his power, but once he has obtained the insight necessary, can defeat foes alone that would fell any other. Vigilant Relic Set (67) - Kingdom of Sky ranger Relic Armor. Not to be confused with the level 80 Guardian set with the same name. Ranger Epic Weapon Series (80) - Rise of Kunark Ranger Epic Weapon. This page last modified 2011-08-25 22:52:10.